The city’s famous Chicken and Prawn Curry and the Oyster Box’s signature Traditional Durban Lamb Curry remain firm favourites. DURBAN, SOUTH AFRICA, October 25, 2017 - Durban, South Africa, the seaside gem of KwaZulu-Natal Province, is best known for its golden beaches and relaxed surf culture which is about to heat up in the summer months of November through March. Maize starches are another staple of Zulu cuisine and are often used in porridges, or in the liquid form as beer. Robson’s Real Beer brewery and restaurant, located on the reclaimed Point Waterfront, is home to one of the oldest craft beers in South Africa. A family-owned business, Robson’s pioneered bottle conditioned beers, made by a method similar to champagne that produces beer with remarkable complexity and taste. The eatery located inside Robson’s brewery pairs natural, locally inspired beers like the Robson’s Pale Ale and East Coast Ale with sophisticated pub fares, like panko-crusted prawns and grilled peri-peri chicken. Robson’s also brews up an immersive experience for visitors by offering beer tasting tours for those wanting an inside look at the craft brewing process. After working up an appetite with a stroll along Durban’s popular Golden Mile promenade, visitors can kick back at one of the beach shack-style eateries where the views and food can’t be beaten. The laidback beachy vibe at Surf Riders Café captures Durban’s quintessential surf culture, offering burgers, pizza, and more, along with breakfast served in biodegradable cartons for visitors to enjoy at a table or on the beach. Afro’s Chicken Shop offers up simple and affordable chicken takeaway in an iconic bright yellow refurbished shipping container. Known for its chicken and “tjips” (chips), Afro’s Chicken also serves post-surf fare like egg and bacon rolls. Butcher Block prides itself on serving the best steaks in the country with locations in Florida Road, Durban’s bustling culinary and entertainment epicenter, and the upscale beach resort area of Umhlanga Rocks. The menu includes meats aged to perfection, like tender fillet stack with herbs and spicy butter, and steak with bacon and biltong, a dried, cured meat that originated in South Africa. 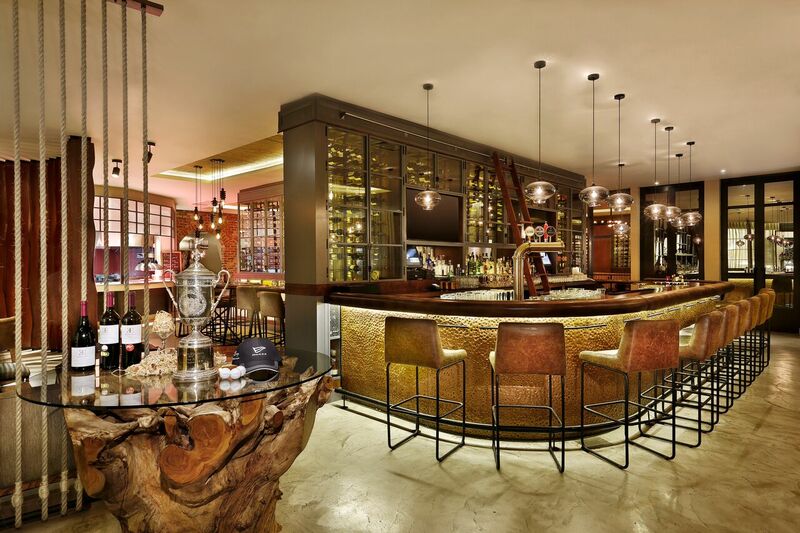 Nestled inside of each Butcher Block location is a celebrated wine cellar, featuring some of South Africa’s best-known wines. Visitors will also want to take their time savoring the bold flavors of the renowned curry buffet in the hotel’s Mediterranean-inspired Ocean Terrace Restaurant with stunning views of the Indian Ocean. Foodies seeking to spice up their life can indulge in more than 10 meat, fish, and vegetarian curries accompanied by homemade chutneys and a selection of Naan. Editor Note: High-resolution images are available here. Located an hour southeast of Johannesburg by air, Durban is the beachfront gem of KwaZulu-Natal Province (KZN). A bustling harbor city and popular surfing spot, Durban lies on the Indian Ocean and is South Africa’s third largest urban area. Remnants of British colonialism and a mix of Zulu, Indian, and Afrikaans traditions give the city a rich cultural heritage, while outdoor activities abound on the signature Golden Mile beachfront and in the lush rolling hills that encompass Durban's suburbs.